Meet 11 year-old Carmelo. This young boy has experienced the hardships of Spina Bifida and hydrocephalus. Sadly, the combination of illnesses causes several challenges. Carmelo cannot sit upright without support. His mobility is also limited to a power wheelchair. Remarkably, Carmelo does not permit his handicap to control his life. Carmelo enjoys many fun activities. He likes to learn and his favorite subject is computer science. He is also a big boxing fan. The young boy’s determination is an example of a Rocky Balboa line, “[Life] is about how hard you can get hit and keep moving forward.” We are all very proud of Carmelo the fighter! 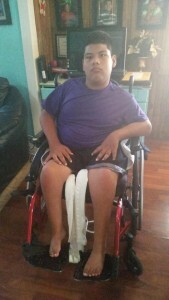 Wheelchairs 4 Kids is helping Carmelo to receive special equipment that will improve his stregth and posture. Be a sponsor soon!